The type of books you read tell much about your personality. A personal library handed down from one of your ancestors can be a treasure without measure. However, not everyone in the family can benefit from receiving an ancestor’s library or books. We recently featured a website that lets you catalog the books that you have read and also lets you wright a review of your impressions of the book. Using the Web, you can preserve your favorite book collections for others to enjoy. We stumbled upon another great (and free) website that lets you preserve the list of books that you’ve read. The site is called Shelfari and lets you include a “bookshelf” of the literary works you’ve enjoyed reading, that you own, or that you want to read in the future and include the bookshelf right on your own website (if you so desire). There are a variety of bookshelf styles that you can choose from. The bookshelves are interactive (meaning, visitors can scroll through the list of books you’ve placed on the shelf). The service is free and will let you, if you choose, to connect with your friends to share info about your favorite reads. How to use for Family History – Take advantage of the option to write a review of the books you’ve read. Wouldn’t you like to know what your ancestors thought about the material they read? You might feel lucky that you at least know what books some of your ancestors enjoyed let alone what they really thought of the books. Think of how beneficial and enlightening it would be if you had written down the thoughts and feelings of your ancestors as they read their favorite books. Those insights would be very valuable to a family history enthusiast. Your descendants and family members will probably have an equal desire to know what you thought about the books you’ve read just as you have a desire to know what your ancestors read and thought about what they read. So, there’s no easier place to start that with yourself. You can log on to the site for free and start to rank and write reviews for the books you’ve read. 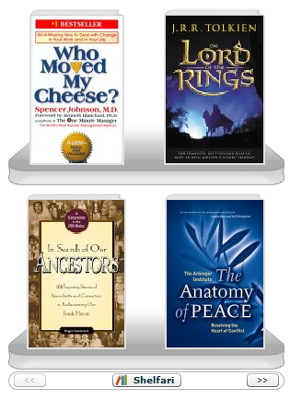 On the Shelfari site, you can easily find books you’ve read. Simple search by the title, ISBN, or author. 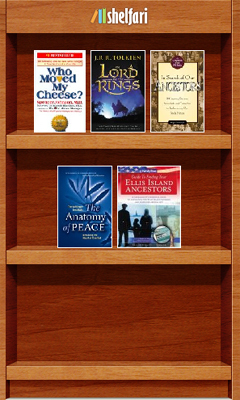 Share your reads by inviting family members and friends to see your book list. You have control as to the level of privacy on the site. Get your friends, children, and grandchildren involved and linked on the site as friends. You’ll then be able to chat about shared interests in your reading and recommend your top picks to your friends. Once your family members have created their list of books, ask them to export them (a feature included on Shelfari) so that you can store their favorite books in their family history folder you’ve created for them (if you’ve been so kind as to create a folder). Why do this you might ask? – From personal experience I can attest that it is worth it. I’ve had many ancestors that have collected books and have written thoughts in the margins of the books. A precious treasure it is to read the same material that an ancestor had and to understand the thoughts, feelings, and insights. The only problem is that because there are so many descendants, it’s very difficult to share the books with everyone. Even distributing out one book per person doesn’t really cover it if the ancestor’s library wasn’t very large. By creating a digital bookshelf online and by writing your review (thoughts and feelings as you would in the margins of a book), you can share with all your family members the books you’ve read, how the books have affected you, and why you thought it was important. As your posterity grows, they’ll be glad to have one more way to get to know you and your family members you helped get started keeping track of literary tastes and insights. Go ahead, have fun and give it a try.